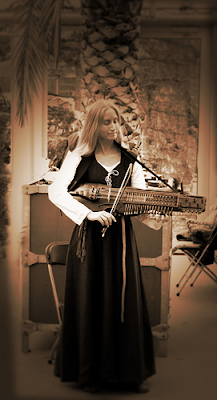 A nyckelharpa (literally "key harp”) is a string instrument. Its keys are attached to tangents which, when the key is depressed, serve as frets to change the pitch of the string. The nyckelharpa is more closely related to the hurdy gurdy than the fiddle. It is traditionally played with a strap around the neck, and stabilized by the right arm. The oldest depiction of the nyckelharpa is a relief from about 1350 near one of the gates to Källunge church on Gotland showing two fiddles – presumingly nyckelharpor of European origin. 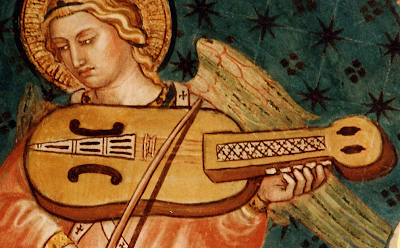 Murals from 1450-1550 show angels playing the nyckelharpa, which is seen as evidence that the instrument was well-regarded. The Swedish province of Uppland has been a stronghold for nyckelharpa music since the late 16th century, and during the 16th and 17th centuries, the ’Schlüsselfidel’ was known in Germany. Nowadays the nyckelharpa is best known in Sweden but is also used to play medieval music all over the world. Please, put the name of the artist with the paintings! Contact me for a better picture of the angelic nyckelharpa player and also the name of the artist.